You thought that the biggest action in Vegas was at the PLO rebuy tournament? Think again. Brian "sbrugby" Townsend, online superstar, and Sammy Farha are currently embroiled in a huge heads-up match that appears as though it is going to extend over a number of days. As many of you know, Townsend is a huge winner online at the high limit No Limit Hold'em and Pot Limit Omaha games. 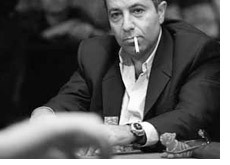 Sammy Farha is an accomplished No Limit Hold'em player and probably the best Pot Limit Omaha player in the world. The stakes are fairly high, with blinds of 500/1000, with the stakes expected to get bumped up to 1k/2k tonight. The game is high Pot Limit Omaha, half No Limit Hold'em. According to Townsend himself, he had Farha down 800k at one time during the night, but ended the night down 500k. According to Townsend, the match was extremely back and forth (not a big surprise) with numerous half million dollars pots. It will be interesting to see how the match progresses tonight. Farha is incredibly good in Pot Limit Omaha, and it would be interesting to see how Townsend withstands if he ends up being down more than a million plus in the match at any time. He made over a million and a half online in May, but I really doubt he just wants to give that away to Farha. We'll keep you posted.